Brigitte and Xavier are a farmer couple who they are living and working in Normandy. They have always got on well until their sons left home, which it caused a bad relationship between them. One day, Briguitte is invited by a group of parisians to a party in a house next to her farm. There, She met Stan, an atractive young man. Some time later, Briguite goes to Paris to meet Stan. 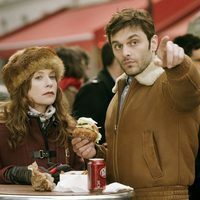 But things do not go as it is planned... French film directed by Marc Fitoussi and starring by Isabelle Huppert ('The Piano Teacher') on the role of Brigitte Lecanu, Jean-Pierre Darroussin ('A Very Long Engagement') as Xavier Lecan , Michael Nyqvist as Jesper and Pio Mamai as Stan. Written by Sylvie Dauviller and Marc Fitoussi. Write your own 'Paris Foilles' review. The role of Xavier was offered to Gérard Jugnot, who declined.